I'm sure you've all heard that Penneys/Primark are sticking their toe into the beauty industry. You might have noticed over the last few months that the PS I Love You line has been gathering more products and more momentum- and now in many Penneys stores, there are dedicated PS I Love You displays, and selected stores now have a little instore beauty bar where you can get a manicure/eyebrows threaded if you wish. Today I'm showing you what I picked up on a little Penneys beauty mission recently. I don't have any of the cosmetics yet- I'm just not so inclined yet- but what I have picked up are some various tools and beauty hacks. I almost always have a nail file in my drawer at work because I cannot abide jagged edges on my nails, so this twin pack was a no brainer. For €1, you get two nail files- one side for buffing, one side for filing. I also saw a little faux beauty blender sponge and I thought I would try this out too because at €1.50, it wasn't much of an outlay really. I'm not really drawn towards foundation sponges so this will be good for testing the waters. Although I generally do a good job at avoiding the kitsch, I was drawn to these fruity sponges, and even if I never use them and just leave them in my bathroom for fruity amusement, it will have been €1.50 well spent! These are actually quite decent sponges and should come in handy in the shower. I know, I know, face wipes, it's almost a dirty word! But before you judge me- hear me out! I never use facial cleansing wipes on my face- I think they are two abrasive and I prefer an oil or micellar water cleanser. BUT I do often put some foundation on my hand before applying to my face with my sponge and I sometimes run a wipe over my eyebrows to wipe off any foundation that ends up on them. I just think they are generally handy things to have- not for the face- and because you get two packs of 25 wipes for €1.50, I reckoned these were worth the punt. Have any of you ever accidentally dug your nails into your eyeshadow rushing around in the morning and not had a nail brush at hand to undo the damage. I've needed to and meant to get one for ages and this one should do the job nicely and it was only €1.50- bargs! Tweezers are just the handiest things to have to hand and I literally could not leave these adorable chevron printed tweezers behind me when I found out they were only €1.50, and it's always handy to have a double pencil sharpener to hand to pare those pencils in a jiffy- and again, for a €1, I couldn't leave it behind. These sponges were just €1 each for a twin pack and I picked up a cellulose and exfoliating set. I use cotton buds on a daily basis- not just for cleaning out my ears, but for tidying up eye makeup, mopping up nail polish mistakes etc. I thought this little one for 50c would be absolutely perfect for travelling because the case is nice and compact but good and sturdy so your buds will be kept clean and together in one place instead of strewn all over your suitcase. I also thought I would give the nail polish remover pot a try because again, these are handy for travelling. My last purchase of this exhibition was the Facial Cleanse and Massage brush which reminded me somewhat of the Shiseido cleansing brush. I was hoping that the bristles would be quite soft on it and I am delighted to be able to inform you that they are not too abrasive at all for us sensitive skinned types. I will of course be using this once/twice a week max. 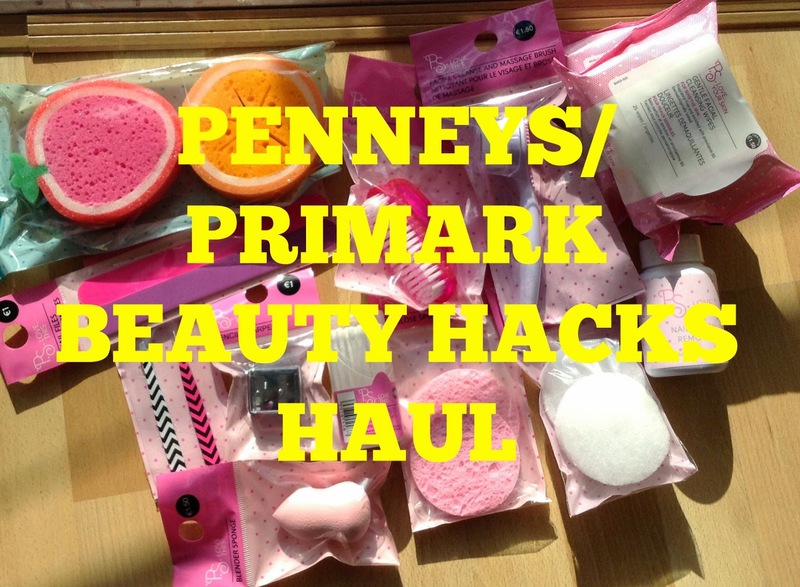 And that concludes my first Penneys/Primark hack haul from the PS I Love You line. Have you picked up anything from the range yet? Is it something you would be interested in? Great tip using the wipes to remove make-up from your hand after applying foundation! Simple but genius!